Smitaki: July 30 – Help, somebody ran off with my phone! July 30 – Help, somebody ran off with my phone! I must admit that since the attack of the camel spider on my terrace, I have not been at peace sitting outside after darkness falls. The monster of the screen door can be death, but barely a week later another camel spider stormed over the terrace, straight towards me and I barely managed to jump aside before the monster disappeared into the dark bushes where the cats, in vain, tried to locate him. When it’s dark, so many things crawl, run and walk around the bushes around the house. Apart from the cicadas, who are making a deafening sound due to the increasing heat, on the ground amidst the dry grasses and the plants there is a lot of swishing as the cats spend long hours engaging in their nightly hunt. Not that they hunt everything. Some animals are difficult to catch: like the two hedgehogs which come every evening to look for the cat’s leftovers. Whilst there they also have a little nip from the water trough. They are so cute I just have to stroke them and the cats, who watch carefully what the hedgehogs are up to, keep a clear distance. My dogs also think hedgehogs are interesting, but they are wary of having a fight with such a prickling ball. 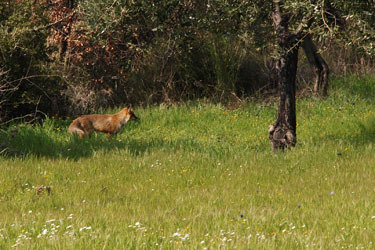 The natural enemies of hedgehogs are badgers, fitches, pine martens, lynx (which we do not have on the island), wild boars (which have been reintroduced for the hunt around Ayasos), foxes, hawks, golden eagles and eagle owls. I have no idea if we have badgers or fitches on Lesvos. What I do know is that under the roof tiles of my house there lives a noisy family of a kind of rats, although I think they could be some other kind of animal. The list of mammals of Greece, offers up an endless number of mice – or ‘rat-alikes’ (under the chapter Rodentia), all with beautiful names. The family living above me have white bellies, as far as I can see; they barely show themselves, except for their tails, which you can see when they flee the house over a tree branch or an electricity line. Sometimes they have a party and yell and scurry, like children playing games, from one side of the roof to the other. If I don’t interfere they might well celebrate long into the night. But when I knock with a broom against the ceiling, they become perplexed and fall silent. There aren’t many rabbits on Lesvos, although I sometimes spot a hare jumping over the road. Lemnos is the island full of rabbits, often a plague for the agriculture there. Squirrels and moles are plentiful on the island, and one can often see holes in the earth which I guess belong to other animals (which ones I have no idea). Greece also has a long list of bats. Around twilight small batmen fly around my head when I sit outside, but I can’t see the difference between two bats in the darkness. The biggest mammal here on the island (I don’t count the wild boars, as they have not come in a natural way to the island) is the fox which lives here in great numbers. You not only see them darting in front of your car, but more and more often, you stumble upon them while having a walk. Last week I went for dinner to some friends in Molyvos and I wondered about the assorted weapons they had next to the dinner table: a bucket of water and a plastic water-gun, a toy normally for children — although they had none. The story was that their cat had a bad encounter with a fox, which wounded her and since then they began their hunting season for foxes. Not only had he lain the cat low for some days, but shoes also started to mysteriously disappear from the terrace and the house. I like to see foxes, they look cute, but were I to have to buy a new pair of shoes or a mobile phone every day, I too would buy a water pistol. In the same vein, I now have a glue spray ready for when the camel spider dares to show his face again. Even in ancient times Greeks didn’t know what to do with foxes. The ancient city of Thebe once was being punished by a God with a huge fox (Teumessian Fox) that attacked children and it was known that he could never be caught. The regent had a hard time figuring out what to do; he decided to enlist the help of the mythical dog Laelaps, who was renowned for always catching his prey. Just imagine the sight of those two: the dog endlessly chasing the fox through bushes, along beaches, through woods, over mountains and so on. After a while – or maybe even an eternity – Zeus took pity and changed both animals into a rock and later he put them between the stars, two constellations now known as the Little and the Big Dog. On nice evenings you’d better look upwards to the stars, rather than down towards the creeps, and you’ll see a large array of animals such as a dog, a fox, a bear, a horse, a goat, a bull, a hare, a fish, a scorpion and a lobster: they are all placed in the sky for eternity. August 20 - Yammi, a bami!